Facebook held a press event yesterday to introduce some new features and also announce that the network will continue to roll out updates and designs in the coming weeks and months. The Facebook redesign wasn’t rolled out yesterday but it’s coming up soon. There were 3 major new features that were unveiled at the event and they’re already creating a lot of buzz online. The first is the new “Groups” feature that allows a group of friends to create a secret group which can be controlled by all members. 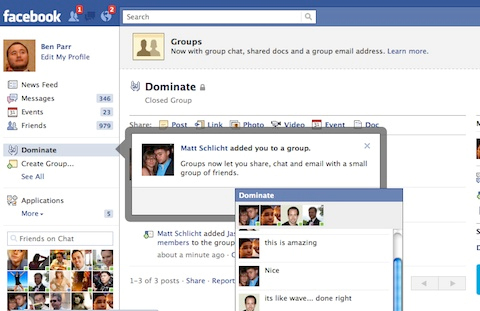 The group’s setting is set to ‘closed’ by default but you can choose to make it open/public. Members of a group can perform all tasks that they otherwise do on Facebook e.g. sharing photos, links, videos, documents wall posts and chat, within the group. Another new feature introduced yesterday is best described as ‘Data Portability’ as now you have the option to download all your data uploaded to your Facebook profile. This includes all your photos, videos, documents, wall posts, conversation threads and status updates. This information will be prepared and downloadable as zip file. Rather than just getting all of the data in a structure-less archive, the data can be viewed in your web browser and will be easy to access and sort through. You can start downloading your data by accessing a new feature in the Account Settings section of your profile. After re-entering your password, your data will be prepared and you will get a notification when the file is ready for download. The new application control feature allows users to see how many sites and applications they’ve allowed to access their personal data through the network and Facebook Connect. The feature is a dashboard which will appear in your privacy settings and will help users control what content an app can access from their profiles and even prevent an app from posting content on their walls. The dashboard will also show a detailed access log of what API calls each app is using and also allow the user to completely remove an app from within it. This is a major upgrade in privacy regarding applications which have been criticised a great deal in the recent past. The new features are currently being rolled out to users worldwide and should be activated for all users today.